Welcome to Colburn & Elk Insurance and Real Estate, located in the heart of downtown Storm Lake. Let the Lighthouse lead your way to the city's beautiful parks and bike trails that surround the lake, and many holiday celebrations. Is there any reason not to live or do business in Storm Lake "The City Beautiful?" If you are stopping by or just passing through, come and learn about our diverse community. Interested in buying a home? 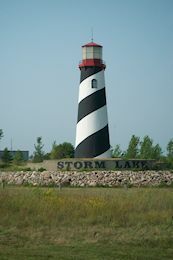 Check out www.realtor.com and see listings of quality Storm Lake and area homes. Here at Colburn & Elk, we are "a team committed to you". We can assist you with all your home buying needs. In the market to sell your home? We can help! As an affiliate of Iowa Realty, we not only have access to listings in the Storm Lake area, but real estate markets throughout the state of Iowa. You will receive outstanding service and your listing will appear on the Multiple Listing Service and the Iowa Realty website at www.stormlakeiowarealty.com. In the market for insurance? The team of professionals at Colburn & Elk will help you with all your insurance needs. From auto, homeowners, commercial, life and health. Give us a call. We can give you a no-cost insurance quote.